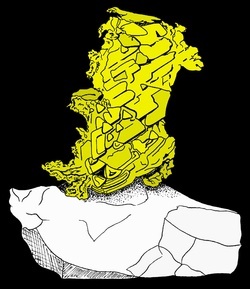 Native gold was declared The Golden State’s official state mineral in 1965. (Yes, California is also known as “The Golden State.”) Gold was first discovered in 1848 on the American River at Sutter’s Sawmill. Once word got out that gold was to be found in California, the great gold rush was on! It is estimated that over 125 million ounces of gold were recovered in California during the gold rush. In only four years, California’s population grew from 14,000 to over 250,000 as people poured in to find their golden fortune.